Welcome to Aviation Dreamer. Here you will get all types of Aviation Job-related update and interview tips for your cabin crew or Ground Staff interview. 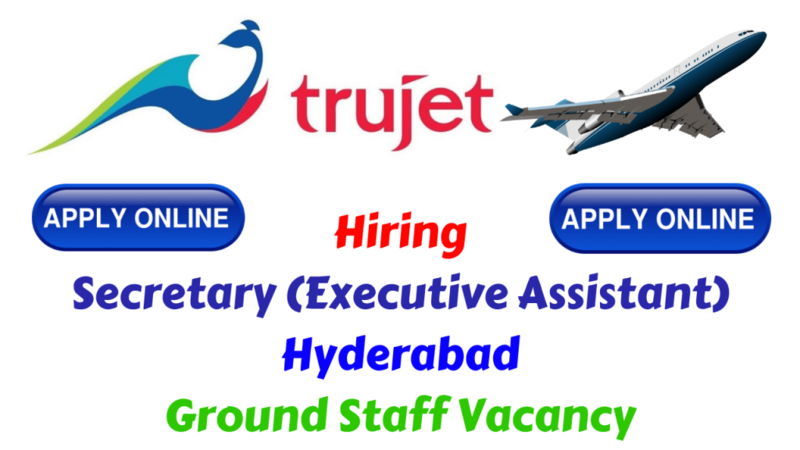 So, in today’s article, I am gonna write on Trujet careers November 2018 – Apply for Ground Staff in Hyderabad. Please check out the full details of this vacancy. Respond professionally with senior leadership/business associates/clients & company’s guests. Handle and attend telephone calls, fax, emails, and other communications. Manage movement, travel & lodging arrangements of the Director. Handle & manage Reporting Officers business associates, clients, and visitors/meetings. Maintain Minutes of the Meetings circulate and follow up with concerned depts. Provide support for preparing circulars, documents, printing, dispatch and other mailing needs. Filing documents and maintaining professional and retrieve when required. Handle specifically assigned projects/database or business MIS requirement. Ensures proper document classification, sorting, filing, and proper storage. To smoothly organize entire office activities incl writing emails & follow-ups etc. Generate required office reports and ensure distribution/closure of issues. Graduate / MBA / PGDM. Working experience of around 3-5 years plus in any organization in a similar position. Computer fluency on MS Office incl. MIS/reports/planning/drafting mails/proposals/presentation. Fully conversant in Telugu/Hindi/English languages. Able to politely and professionally yet effectively interact with a wide range of people/ professional/seniors. To apply it online Click Here. You will redirect to Trujet Online Apply Form and then fill out the form correctly and then submit it to apply. Also if you have Naukri.com account you can apply from that also. Note – If you are searching for any other vacancy then click here to find Trujet Current Openings. Do you have any questions to ask me? related to Aviation jobs or Airlines Jobs. Then feel free to comment in the comment box or you can contact me on my Facebook page and YouTube channel by the same name. Also, I requested you to share this article with all the friends and help them to join the Aviation Industry.